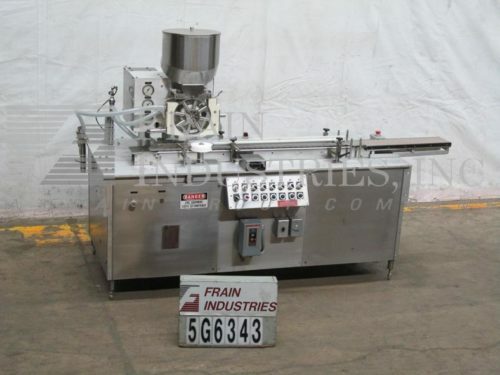 Frain Industries can help you with your vacuum powder filler project no matter how big or small your filling needs. Filler Powder Vacuums are powder filling machines which use a vacuum / pressure source to conveyor and meter the proper amount of powder to the container or vial being filled. Perry Model ESUA, stainless steel powder filler rated from 20 to 120 containers per minute (single dose) – depending on materials and application. Accofil method of vacuum / pressure filling with a fill range of 50 mg to 1.5 gram per single dose, multi dose is optional. Equipped with 9" diameter (8) station dosing wheel with 15mm diameter and 65mm deep chambers 13" diameter x 8" deep hopper with agitation. 3¼" wide x 51" long delrin style conveyor and 6" wide x 23" long roller conveyor with an infeed and discharge height of 33". On/off switches for power, vacuum pump, filler, agitation, conveyor, hopper, and press roller. Variable speed controls for agitation, conveyor, hopper, and press roller. LED display for RPM and pressure guages for dose, vacuum and purge. Perry Model E-1300, semi automatic, table top vacuum powder filler rated from 10 to 40 single dose fills per minute – depending on material and application. Fill Range: 50mg to 15g with accuracies + / -1%. Container Size Range: 1/2" to 5" in diameter 1/2" to 8" in height. Equipped with 10" diameter x 12" deep covered product hopper, 8" in diameter dosing wheel, with (8) 3/8" diameter vacuum fill nozzles and has gauges for vacuum, pressure and dose with vacuum pump, foot pedal and e-stop. Control panel has start, stop, dosing wheel, vacuum and agitation controls and is capable of multiple dosing to twelve fills in same container. All stainless steel contact parts. 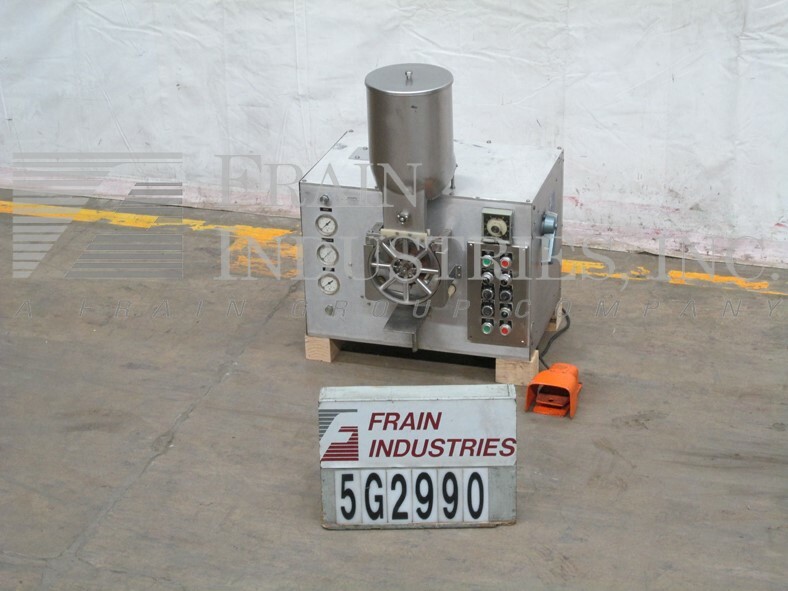 Vacuum powder filler / stoppering unit. Container size range of: 0.75" to 2.5" in Diameter; 1" to 6" in Height. Fill capacity: 50 milligrams to 1.5 grams. Can accommodate stoppering sizes: 11, 13, 20, 28, and 30 mm. Equipped with a 30" diameter unscrambling table with 20 x 20 load area, a 48" by 2" stainless steel mesh conveyor, product hopper, an 8 position Accofil rotary vacuum / pressure fill wheel, stopper hopper, stopper peal off station with dual compression rollers, dual 12" x 1 " single gripper container belts and 30" diameter accumulation table. Controls for start, stop, unscramble, dose, stopper, and accumulation and e-stop. Stainless steel system. Change parts required to accommodate size / fill range. Speed dependant on materials and application.